Liam Neeson's most recurrent role of late – that of a dad whose outrage fuels a violent vigilante campaign – has always been preposterous. 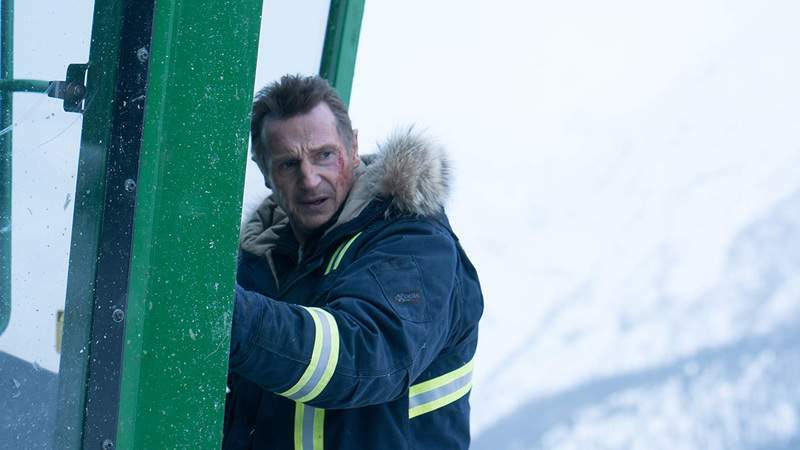 But it's never been nuttier than in “Cold Pursuit,” an action thriller in which the Irish actor plays Nels Coxman, a snowplow operator at a Colorado ski resort with the death-dealing skills of a special-ops commando. The story begins with a murder that's unwarranted: Nels' son Kyle – an airport baggage handler played by Michael Richardson, Neeson's real-life son – tangles with drug thugs, and is eliminated with a forcible overdose of heroin. Improbably, the cops assume that Kyle's OD was self-administered. It's left to Nels, the grieving father, to beat, choke and shoot his way to the truth. Nels' ultimate target will be a man called Viking (Tom Bateman), a prissy Denver crime boss who, like Nels, is also a doting father. Brutal with both rivals and subordinates, Viking is just as ruthless in protecting his boy, Ryan (Nicholas Holmes), from the dangers of high-fructose corn syrup. Ryan, of course, is a prodigy. Few viewers will be surprised to learn that the boy turns out to be in the market for a surrogate father-type – one who, unlike his actual dad, is gruff but upright. Writer Frank Baldwin, who transplants Kim Fupz Aakeson's original screenplay from the mountains of rural Norway to the Western United States, multiplies the mayhem by introducing a rival drug gang. Led by a man (Tom Jackson) who's also mourning a son, this Native American criminal operation – which is presented as defending tribal land – replaces the interloping Serbians of the earlier movie. After the death of their son, Nels and his wife (Laura Dern) become estranged. Their failing relationship mirrors that of Viking and his ex (Julia Jones), with whom he splits custody of Ryan. The movie also introduces several other pairings, including a weary older cop (John Doman) and his conniving young partner (Emmy Rossum). She's just thrilled that big-city crime has finally invaded the quiet town they patrol. Moland shares that cop's perverse delight. This will make “Cold Pursuit” a treat for fans of gory, Tarantino-style romps. Yet the movie is never more than a minor entertainment with a taste for major havoc. Crossbreeding “Taken” with “Reservoir Dogs” is an amusing idea, but not an extraordinary one.